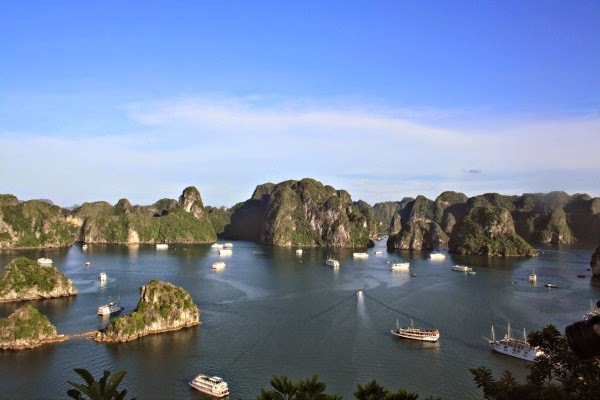 Halong Bay is one of the most beautiful places in the world, there’s no doubt about it. 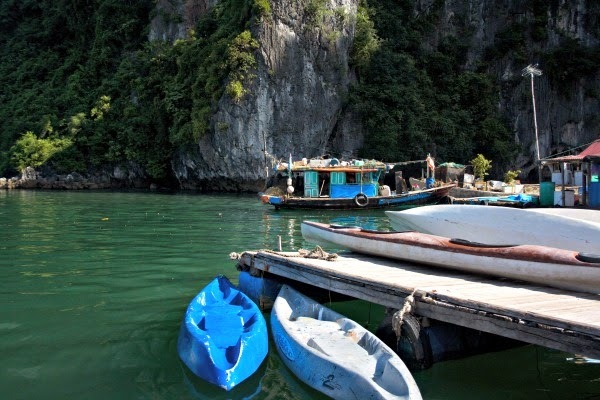 I booked a kayaking Halong tour there when I was in Vietnam for two weeks in August. To be honest, I didn’t know that much about the place beforehand but somehow had heard it was awesome and so decided to check it out. I’m glad I did. It was 5 hours from Hanoi, but worth every minute of the journey. Just a short boat ride out and we were greeted by these huge limestone karsts just scattered in the bay. Apparently there are thousands of them, but we must’ve only seen a small per cent during our time there. The smaller boat took us out to this the ‘Surprising Cave’. 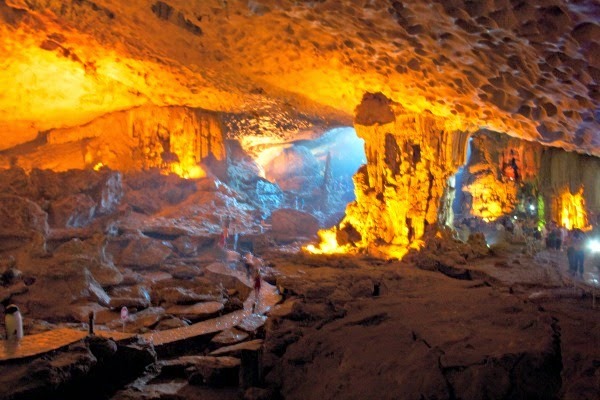 As soon as I step foot in the place I was amazed – I didn’t realise then how huge the cave was. It was exciting for me to come across on a guided tour, imagine being the person to discover this place all those years ago?! It was so hot and humid in there – note the lack of piccies of me here – I was a sweaty mess. The ground was slippy too, a few times I slipped off the path. 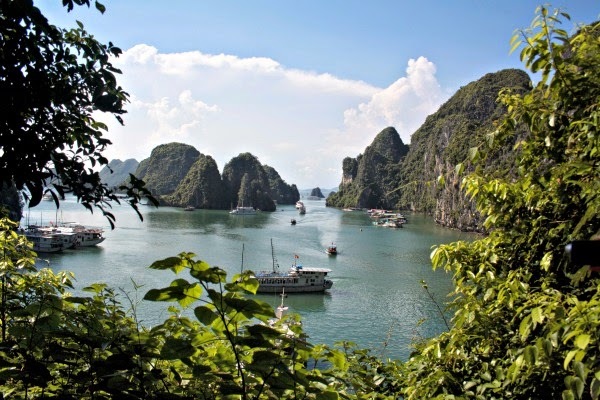 If you’re going investigating places like this on holiday you need to make sure your travel insurance covers any sort of adventure activity, even if you have to pay a premium on it. Just check with your provider if you’re in any doubt, but do make sure. As long as you stick to the signposted walkways, and can walk steadily you’ll be fine but there’ll always be that one person who decides they want to go and explore further. Don’t be that person. The way they’d lit the Cave of Wonders up just made it all the more incredible. 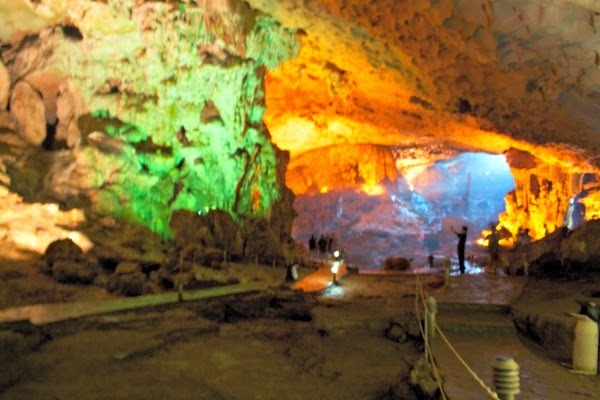 Stalagmites and stalactites were everywhere but the cave was so huge it never felt claustrophobic. They took us kayaking tour on the second day morning – if you’ve ever kayaked before could you let me know how you steer the ruddy thing in the direction you want it to go? I was hopeless. We stopped to swim at the beach and there was a pathway to climb the limestone and look out over the bay, this was the incredible view.